Are you searching trusted locksmith in Cobb County area? Our expert technicians offer 24 Hour emergency locksmith in Cobb County, GA. Call us now to schedule local locksmith. Have you been searching the internet for a qualified “Cobb County locksmith near me?” Then you’re in luck. 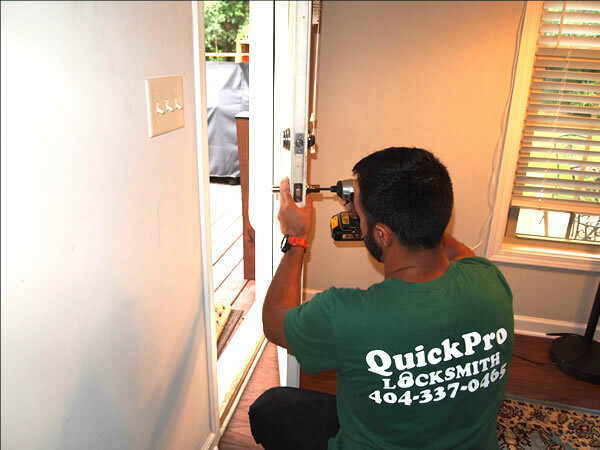 If you live in Cobb County, Georgia or the surrounding metro Atlanta area, the team at QuickPro Locksmith is here to help. Whether you’re searching for an auto locksmith, commercial locksmith, residential locksmith or 24 hour emergency locksmith, our experts have the tools and experience needed to get the job done right. Contact our office today for more information about our wide range of services or to schedule a time to meet with a reliable locksmith in Cobb County, GA today. Are you looking for more ways to safeguard your home against burglary? Is it time to upgrade your minimum standard pin and tumbler locks to high security deadbolts and smart locks for added protection? Whether you need a completely new lock installation, or you’re in need of a rekey service, lock repair or emergency lockout assistance, we have a residential locksmith whose ready to help make your home a safe and comfortable place for you and your loved ones. Businesses have a unique responsibility to protect staff, customers and anyone who steps foot onto your premises. In addition, companies also must do everything in their power to defend themselves against financial losses, theft and vandalism. We understand how important it is to have high quality access control, and that’s why our experts are excited to offer a wide range of commercial locksmith services including lock repair, rekeying services, keyless entry system installation, smart surveillance installations, panic bar repair and replacement, safe installation and repair and so much more. Call today to find out how we can help you better protect your assets. Drivers also need to have a dependable auto locksmith available in case of emergencies. You may accidentally lock your keys in your car at the grocery store, or find yourself struggling with the ignition at 1am on a Saturday night. Towing services, car dealerships and auto mechanics are expensive, and often take too much time and inconvenience. When you hire an auto locksmith from QuickPro Locksmith for the job, we will come to your location with all the tools it takes to get you safely back on the road fast. Our affordable prices, 24 hour emergency response and highly trained technicians makes your automotive lock and ignition issues an easy hurdle to overcome. Not every Cobb County locksmith is willing to accept service calls after normal business hours. Unfortunately, nights and weekends are often the times when people run into the most issues with their locks and keys. At QuickPro Locksmith, we put our client’s needs first. That’s why we proudly offer our emergency locksmith services 24 hours a day, 7 days a week for Cobb County residents, businesses and drivers. Are you still on the internet looking for a professional “locksmith near me”? Then call QuickPro Locksmith. Our friendly, knowledgeable staff is always available to take your call, so you can find a fast solution to all your lock and key related problems.